The bears all sit with me as I work on them. I pick them up, I pose and play with them. I have them for a little while as my own. The final photos of the bears are a chore, they takes hours. The photos I take while I'm playing are quick and fun, and really the photos I love the best. These are the Quinlan Show work in progress bears, I was playing with them this week. 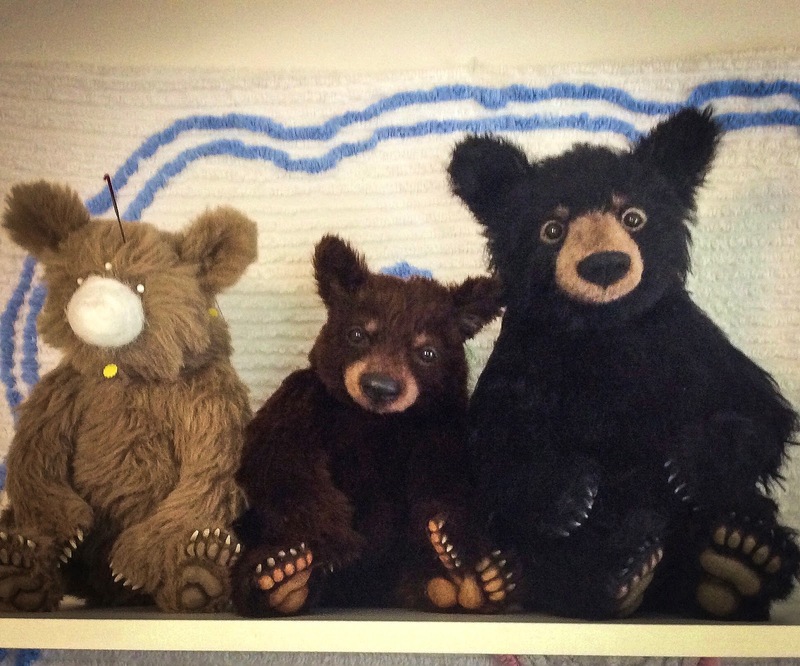 I am a ball jointed doll collector, and I really love to photograph the bears and the dolls together. This little girl would like to keep this knitted mouse, but I must tell her no. Ruby is not one bit afraid, what a brave little soul. I'm hoping for a total of eight bears for the Quinlan Show. Bear work time is limited. I want to bring the best eight bears with me that I can create. That means taking my time, enjoying the process, and that includes playtime. Three black bears, a blonde, a cinnamon and a black in different stages of progress. The finishing work is what takes me the longest. As I begin work on the blonde’s face, I continue working on the other two. The cinnamon has been trimmed, and I’ve been working on shading. The black bear has been trimmed, but no shading yet. As the group grows for the Quinlan Artist Doll and Teddy Bear Convention, I’ll continue to play around with the shading especially till I walk out the door with them.